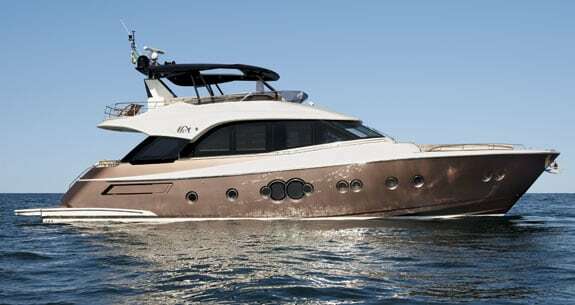 Monte Carlo Yachts put a lot of thought into the 70—from fabrics to layout to profile and arrangement. But for Executive Editor Bill Pike, it’s the propulsion, baby! 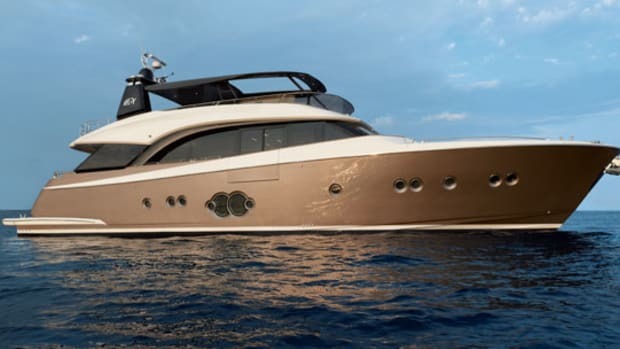 The Italian-built Monte Carlo Yachts 70 is both stylish and solidly equipped, but her big ZF pods add some highly refined oomph to the mix. While strolling across the parking lot from my rental car, I found myself toying with an intriguing question—precisely how would the new Monte Carlo 70’s optional ZF POD 4000 propulsion system perform, both dockside and offshore? Over the years, I’ve enjoyed sea-trialing many a pod-propelled vessel, all with either Volvo Penta or Cummins Mercruiser products in the basement. So a set of staunch ZF 4000s? Teamed up with two equally staunch 1,200-horsepower MAN V8-1200 diesels? I figured the 70 was gonna hand me a modest jaunt into the unknown, something that often gets pretty dang entertaining. 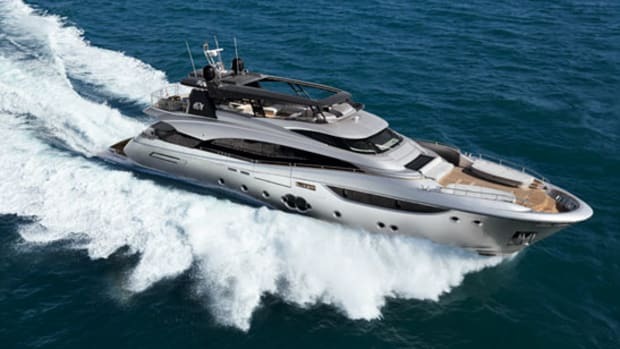 In swoopy, Nuvolari-Lenard-designed, Italianate splendor, the 70 awaited alongside the fuel dock behind the Bahia Mar in Ft. Lauderdale, with a northwesterly wind pinning her forcefully against her fenders. 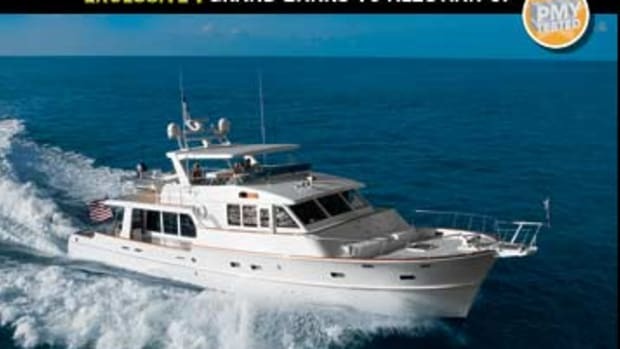 After stepping into her teak-planked cockpit and exchanging pleasantries with Justin Onofrietti, the onboard rep for Denison Yacht Sales, Monte Carlo’s stateside dealer, I headed up the molded-fiberglass stairway to the flying bridge while Onofrietti went forward to supervise line-handling efforts. The MANs were already idling quietly. Before maneuvering any vessel dockside I give her engine controls a lines-on tryout first, both to make sure the controls actually work and then to gauge their effect. So, before giving the signal to cast off, I ever-so-faintly twisted the joystick to port. Whoooooomp! The bow moved both perceptibly and instantaneously despite the wind. I nudged the joystick to starboard and got the same result. Wow, I exclaimed to myself. It certainly looked like there’d be no need for the just-in-case Side-Power bow thruster I’d just energized. Walking the 70 off the fuel dock was an extravaganza. The movement was authoritative, seamless, nuanced, and ultra-controllable. Indeed, in order to clear a megayacht picking up her anchors just beyond our bow, all I had to do was rotate the top of the joystick slightly while keeping the sideways pressure on—the 70’s big ol’ diesels and props eased her away into the center of the fairway with the smoothness of a hound dog’s nose. In short order, our sea trial offshore was proceeding just as smoothly, despite wind gusts of 20 knots and confused seas with occasional 6-footers. The top speed I recorded in open water was 32.4 knots, with a 25.5-knot cruise. 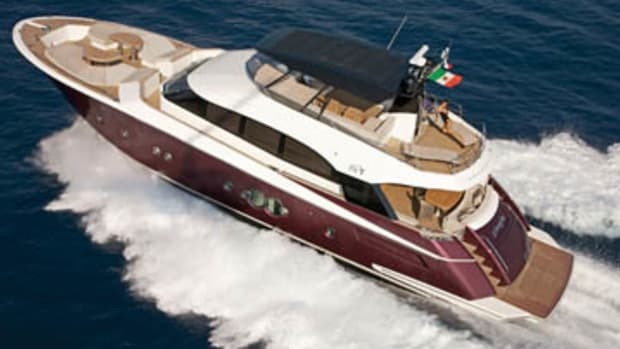 Sound levels at the lower helm (where I did my data collection) were exceptionally low, thanks in part to sound-and-vibration-insulated, soft-mounted interior floors and overheads, as well as an engine room Onofrietti said was buttoned up with the same sort of noise-nixing technology. And the windshield stayed nearly bone-dry—I only had to hit the pantograph-style Gallinea wipers a couple of times throughout. Some years ago I attempted to dock a 48-foot joystick-enabled, pod-propelled vessel stern-first in a slip in a cross-wind blowing about 30 knots. I eventually did the deed (after five increasingly hair-raising tries) but not without experiencing a bit of trauma. Not only did I slightly ding the swim platform, I supercharged my psyche to such an extent that my hands shook for about 20 minutes afterwards. The reason for all this? Stubborn pride, for starters. I should have docked the boat bow-first instead of sticking to an obviously faltering strategy. But then there was something else, at least in my estimation—the pod system on the boat was quite frankly outgunned by the conditions at hand, particularly the wind. Or more to the point, to handle extreme conditions the vessel needed a bow thruster in addition to her joystick-enabled pods. Which was why I was so gratified to see a Side-Power bow-thruster control panel at each of the helm stations on the Monte Carlo Yachts 70. You’ll probably seldom need a thruster while docking a vessel of this sort. But if you ever do, it’ll come in right handy. Trust me. 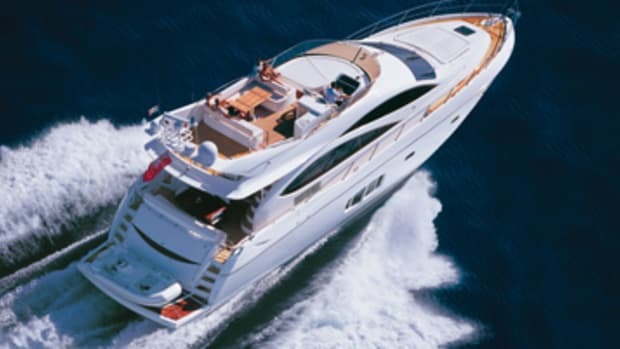 Downsea tracking was particularly noteworthy—in fact, it was so arrow-straight and mannerly that I let the boat steer herself (with my hands lightly on the custom, leather-wrapped steering wheel) for long periods, some lasting almost a minute. 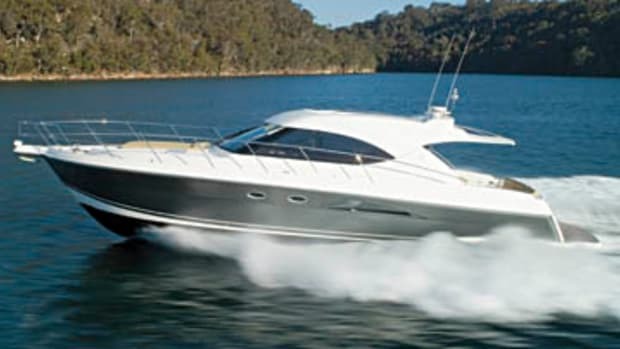 And cornering was tight enough (I’d put the tactical diameter of the 70’s hardover turns at about three boat lengths) and exhibited only a modicum of inboard heel. Pods from ZF, after all, are not deadrise-mounted (and therefore splayed as with Volvo Penta’s system) but hang straight down on heavy NiBrAl skegs from shallow tunnels. And this feature, besides protecting the aft-facing, contrarotating props, also reduces draft as well as outboard focused, heel-increasing lift in turns. One last, sea-trial-related detail’s worth mentioning here—how sweetly the 70’s three-way, auto-adjusting interceptor-type tabs from Humphree simplified the basic boat-driving experience. While we employed the first of the three tab settings (which optimizes trim for maximum speed and operating efficiency at a given rpm) to record test data, there were two others available, one to optimize both trim and list and the other to remove excess heel in turns and thereby optimize cornering. All three are genuinely liberating. 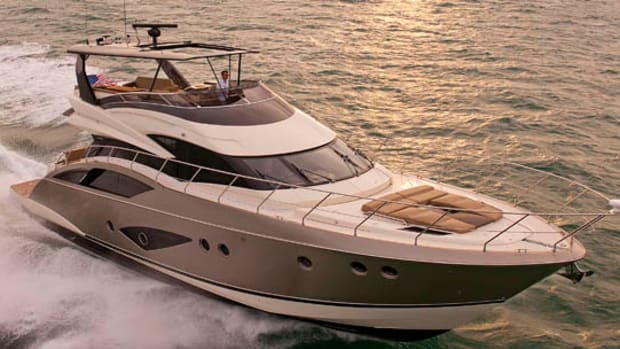 You can’t beat driving a boat—particularly a big one—with a steering wheel and throttles only. And nary a control-surface adjustment to worry about! I began my dockside tour back in Lauderdale in the 70’s engine room, which I quickly discovered could be cooled down nicely via a total of six, giant F.E.I.T. ventilating fans with air/water eductors to nix the entry of salt spray underway. Also facilitating the cool-down were the wide-open watertight doors at the ER’s two access points, one at the transom and the other through the crew’s quarters, accessed via steps under the hatch-like lower portion of the stairway to the flying bridge. The layout was classic. There were two glowing, white-painted mains, with a 2-foot-wide walkway between them covered in thick, aluminum diamondplate. Walkways outboard of the mains were each about 13 inches wide and also covered with the same diamondplate. Gensets in sound shields were located beyond each outboard walkway, both 23-kilowatt Kohlers. 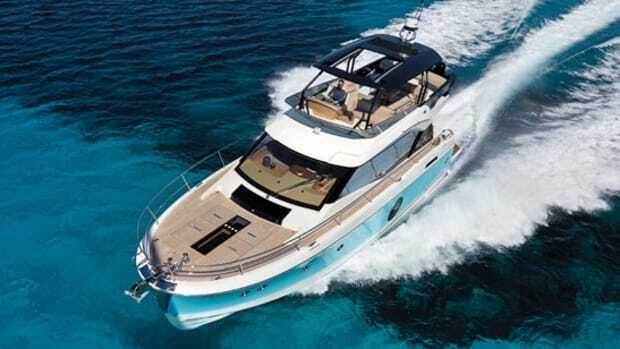 And there were battery banks below the gensets, each comprised of top-shelf AGM Mastervolts, with dedicated Mastervolt battery chargers for each main and each genset as well as separate chargers for the Quick anchor windlass and the thruster batteries. A heavy stainless guardrail circumscribed the MANs, thereby applying the icing to the classical cake. Engineering was generally solid. While maintenance access to the pods looked pretty challenging—each was located at the rear of the machinery spaces beneath a bunch of obfuscating ancillary components—examples of a true boat mechanic’s sensibility were in much evidence elsewhere. Duplex secondary fuel filters for the mains, for example, were not engine-mounted but instead conveniently bundled in an easily accessed location (at the rear of the machinery spaces on either side of the central walkway) with the primary Racors alongside, also duplex. And the crash pump installed on the starboard main had a fine-mesh filter and two valves with big, easy-to-reach handles to facilitate an emergency pump out. Moreover, other details, like the 6-foot-5-inch headroom, white, perforated-aluminum paneling on bulkheads, and the clear labeling (in English) of virtually every pump motor, seacock, and strainer, produced an orderly, straighforward ambiance. The interior of our 70 (the four-stateroom version as opposed to a three) was as classically laid out as her engine room, with a wheelhouse, galley, and saloon on the main deck, and a master (amidships), VIP (forward), two guest staterooms (port and starboard), and a crew’s quarters (just forward of the ER) on the lower one. While windows (some opening, some not) were numerous topside, there were lots of ports below as well, most of them dogged and hinged to open and close. Ventilation’s always a good thing on lower decks. Outfitting was superb. Appliances in the galley (from Miele and Isotherm primarily) were top notch. Finish on the pickled oak and matte-lacquered joinery was crisp. All four berths in the guest staterooms (at approximately 29 inches wide by 78 inches long) were roomy. The 6-foot-2-inch headroom at the lower helm was a tad stoop-provoking but the sightlines forward and to the sides were good. All the doors, topside and below, had FR&C double-opposed latches, the better to prevent shucking or rattling in a seaway. And there were heads in each of the staterooms (as well as the crew’s quarters), with Tecma MSDs and shower stalls in each. 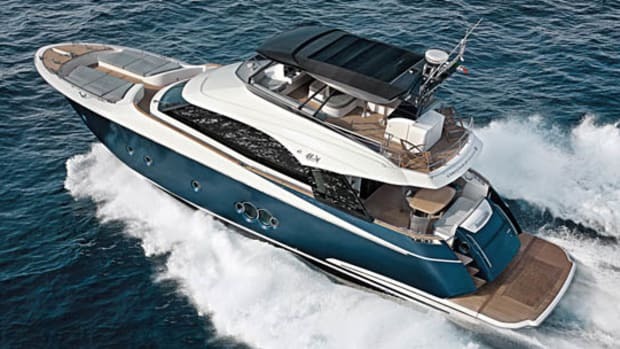 NOTEWORTHY OPTIONS: Humphree auto-adjusting interceptors; carbon-fiber hardtop with sunroof; custom hull paint from DuPont; pop-up LED decklights; Portuguese bridge. 265 gal. fuel, 200 gal. water, 3 persons, 200 lb. gear.